Vertical balanced flue kits share the same EZ-Fit boiler connections as our High Level kits. 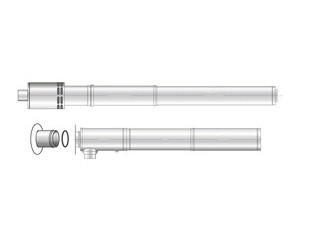 The unique connection system on the Vertical balanced flue ensures easy assembly thereby reducing installation costs. Vertical balanced flues can be extended to a maximum length of 12 metres in a straight run using the extension kits. Deduct one metre for each additional 45° elbow used (maximum 6 elbows).